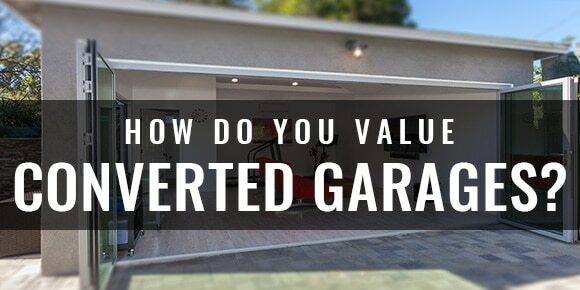 Home » Appraisal Blog » How Do Appraisers Value Garage Conversions? It’s common for homeowners to consider converting a garage, or portion of a garage, into a living space. Whether it’s a man cave, an extra bedroom or just a studio to enjoy your hobby, a garage conversion WILL have an impact on a home’s value. Whether that impact is a positive or a negative depends on several factors. There are many reasons to consider a garage conversion, and most are personal in nature. Here are some of the more common reasons I’ve encountered. Increase in GLA – Gross Living Area. Of course, the conversion must be completed in a way that qualifies the newly created room as “living area”. That means the interior finish must be the same as the rest of the house and the area must be directly heated and cooled. You already have a large driveway and the garage is mostly unused. Maybe you only need 1 bay of the garage so you convert the other half into a gameroom. You can turn the area into a “garage apartment” and rent it out, creating a nice income stream. You’ll need to check with local zoning laws as well as any neighborhood or homeowner’s associations to ensure this is permissible. There can be downsides with any modifications you make to your home’s original design and garage conversions are one of the most impactful. Again, converting the space is usually a decision rooted in personal need and may not consider how the market (and potential buyers) will react. For instance, if you have a 5 bedroom house and you converted your garage into a 6th bedroom as a place for your in-laws, the market will likely look unfavorable on the changes. Here are some other scenarios that could negative impact your home’s value. As mentioned above, if your conversion is not performed in a manner that makes the new space seamless with the rest of the home then it won’t be considered as “living area” in an appraisal. Neighborhood that already have larger homes typically place more value on additional car storage over additional living area. Making structural modifications or major exterior changes such as removing the garage door and framing up the opening are usually unadvised. There are generally seen as irreversible and make your home appealing only to those who specifically WANT the garage converted. If you or your contractor didn’t pull the required permits then you could have a bad situation on your hands as many appraisers and buyer frown upon non-permitted construction. As a rule of thumb, if you’re going to convert your garage it’s best to just frame up the internal area and finish it out. Yes, you will lose some square footage but you can use the space “between the walls” to install insulation which will help with climate control and noise. This type of conversion will be seen as less “permanent” by both the appraiser and potential buyers. How Will a Converted Garage Affect Your Appraisal Value? That question really depends on your market area and what potential buyers value more in a home. If it’s an older neighborhood like Oak Forest with mostly smaller homes, the additional square footage gained from converting the garage is worth much more than the garage would be. If you have a 3-car garage and you’ve converted just a single bay, leaving room for storage of two vehicles, this could bring a positive impact on value. Then there’s the matter of flooring. Typically, the transition from the main living area into a garage conversion must be seamless. This means you can’t have a drastic drop off in elevation or completely different flooring. Once solution is to hire a skilled concrete company like AAA Concreting to lay down a decorative concrete flooring or stain that would pass as an interior floor. If the garage is detached and can be leased out for a decent amount then the additional income may outweigh the lose of the garage. This is especially true in high-rent areas such as the Houston Heights. In other words, it comes down to “are garage conversions typical in this market area”. If yes, then the value is likely positively impacted. If no, then all factors need to considered to determine the influence it will have on the property value. If the conversion was performed as just a frame up and can easily be converted back to a garage then your appraiser will consider the space as either a garage OR living area, whichever will bring more value. If considered a “garage” then there will typically be a small negative adjustment for cost to re-convert the area. ← How Do Appraisers Choose Comparable Sales?